John King of the San Francisco Chronicle profiles architect John Peterson, founder of Public Architecture, an alternative architecture practice with a social conscience. Public Architecture has actually been around for a while--since 2002--but it's just now gaining traction. The basic precept of Public Architecture is to broaden the definition of a client to include everyone who uses a structure, not just the people who pay to construct it. This allows Peterson and his team to embark on what may be called the architecture of incremental idealism. Public Architecture fixes small problems that impact, however subtly, the fabric of urban life. While cable TV shows conduct whirlwind transformation projects for tearfully grateful families, Public Architecture builds small shopping plazas in neighborhoods that are victims of poor city planning. Another project in the works will provide shelter for day workers as they wait to be hired. To encourage other architects to engage in socially-conscious projects, Peterson wants to institutionalize pro bono work in the profession by asking architects to devote 1% of their billable hours to pro bono projects, much like attorneys have done for years. 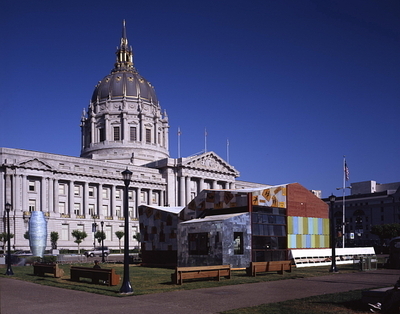 Although Public Architecture works mainly behind the scenes, it has engaged in one publicity stunt: the Scraphouse, a house made of computer keyboards and old telephone books and erected on the grounds of the San Francisco City Hall in 2005. King calls the project "a wry critique of the culture of disposability," but I think the Scraphouse, intentionally or not, was a comment on the difficulties and challenges of the type of socially-conscious architecture that Public Architecture advocates. The Scraphouse's cobbled-together look recalls the improvised tin shacks that poor people in the developing world have constructed around major cities like Manila and Cairo. In the 1960s, when these vast labyrinths of desperate poverty and improvised building techniques first appeared, Western architects swooped in and initiated a number of well-meaning but generally unsuccessful public housing projects. Intellectuals like the Egytian Hassan Fathy looked askance at these condescending projects that totally ignored local conditions, although in some cases, including Fathy's, Western functionalism was replaced by post-colonial romanticism. But not all of the Western-influenced public housing projects were unsuccessful. The Barriada project in Peru, built in 1968, is an exception because the Western architects paid close attention to social practices that had emerged from the slums themselves. The Scraphouse is also a stand-alone structure, making it as much a piece of public sculpture as an exemplar of transformative architecture. The modernism of the 1930s,a period that saw some of the most intensely idealistic architecture in history, was more successful when it addressed the fabric of the city as a whole, or at least a significant portion of it, such as in the work of the brilliant Dutch architect Michel de Klerk. It's this checkered history of committed architecture that the Scraphouse symbolizes, and what John Peterson and Public Architecture are trying to redress by engaging in unspectacular but well-contextualized projects. In place of grand utopian gestures, Public Architecture aims to improve one small thing at a time. And if mostly what Public Architecture has produced since its inception in 2002 is talk, that's okay, too. Peterson is trying to change the American architecture, a profession that needs to change. As today is Hassan Fathy Birthday, a noted Egyptian architect who pioneered appropriate technology for building in Egypt. Fathy was recognized with the Aga Khan Chairman's Award for Architecture in 1980. Architectural Model Making in UAE pays his tribute to Hassan Fathy.